My favourite Fred Astaire-Ginger Rogers routine is the wonderfully soulful dance sequence towards the end of Swing Time, one of their best films. The scene is set up by a series of misunderstandings of the sort that the Hollywood romantic comedy of the 1930s could toss off with both hands tied behind its back. “Lucky” Garnett (Astaire) has just discovered that his dance partner and true love Penny (Rogers) is going to marry someone else. He corners her on an empty stage, sings the stirring Jerome Kern composition “Never Gonna Dance”, and then gently persuades her into gliding about the floor with him; their movements gather urgency and passion, eventually growing into a full-fledged routine that ends with Rogers breathlessly pirouetting into – and out of – his arms. The sequence ends with her rushing out of the room as Astaire strikes a tragic, balletic pose. Fade to black. And then we return to the film we were watching before this great scene began (billed in the poster above as "a glorious songburst of gayety and gladness"). In the final 10 minutes there is some slapstick comedy, some quick tying up of loose ends, a tidy reconciliation between the lovers, a final clinch. It’s a bit anti-climactic, really, because what a viewer will take away from Swing Time is not this neat happy ending but the mournful symphony that had preceded it – two star-crossed lovers, alone together for seemingly the last time. Nothing else in the film suggests that the tale of Lucky and Penny is a tragic love story (with those names, how could it be? ), but the illusion is sustained for those few minutes. To an extent, all the best Astaire-Rogers dance duets – the joyous ones and the sad ones – existed outside of, and transcended, the films they were in. Watching Swing Time again, I was reminded that in many ways they transcended the era as well. For sheer depth of feeling, “Never Gonna Dance” goes beyond almost anything else you’ll see in 1930s Hollywood, and I’m speaking as a huge fan of that period. This is performance art at its very best (and it was certainly treated as performance art: though it looks so spontaneous and unaffected onscreen, days of planning, rehearsing and retaking went into each of the Astaire-Rogers dance setpieces. Astaire was also particular about having them filmed in continuous takes). Swing Time begins in classic screwball-comedy style, its two leads “meeting cute” when Lucky, a vaudeville performer, comes to New York to try and make the 25,000 dollars that will allow him to return to his hometown and marry his fiancée. Penny is a dance teacher with whom he (in this order) banters, trips about the stage, warbles, tap-dances, and falls in love. They are clearly meant for each other (they are Fred and Ginger, after all), but he’s an honourable guy, and what to do about the girl he has waiting back home? Also, what to do about the smarmy orchestra leader who has proposed to Lucky? Complications ensue. Though Astaire and Rogers were both charismatic performers who were very good at light comedy (and, later in their careers, in dramatic roles too), such was the magic they created in their dances that it was difficult to work up much interest in the non-musical sequences in their films. Even so, Swing Time (along with Top Hat and, to an extent, Shall We Dance) is among the few films that hold up passably well even in the tone-deaf scenes. It would be a stretch to say it approaches the quality of the sophisticated comedies made by, say, Ernst Lubitsch, around the same time, but it has some sharp dialogues and engaging performances by Victor Moore and Helen Broderick (in supporting roles as Lucky and Penny’s middle-aged sidekicks). It must be said that the film feels schizophrenic at times: the script and the performances make it very much a product of its period, but the dances are timeless; the predominant tone is light comedy, but the music is so elegiac. 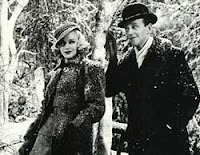 Often, an uneasy balance is struck between goofy humour and the lush romantic mood generated by Kern’s melodies, so that when Astaire serenades Rogers with the lovely song “The Way You Look Tonight”, the scene ends with him looking up from the piano to discover her looking down at him adoringly...and she has shampoo suds in her hair. Another song, “A Fine Romance”, which has Penny complaining about Lucky’s lack of ardour, combines a wistful melody and a beautiful, snowy setting with sarcastic lyrics (“We should be like a couple of hot tomatoes/But you’re as cold as yesterday’s mashed potatoes...You're calmer than the seals in the Arctic Ocean/At least they flap their fins to express emotion”). And even “Never Gonna Dance”, in the midst of its romantic hand-wringing, manages to sneak in a wry reference to Groucho and Harpo Marx. Among the other highlights, my favourite is the brilliantly uninhibited dance duet that takes place when Penny is about to be fired and Lucky decides to show her boss how much she’s “taught” him (the very idea of Astaire being a clod with two left feet, “as awkward as a camel”, makes for fine comic material in its own right. 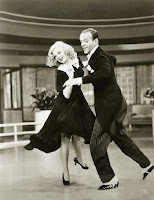 “Nobody could teach you how to dance in a million years,” Penny tells Lucky at one point, possibly a reference to Astaire’s real-life reputation as an untrained genius). There’s also Astaire’s tap-dancing solo “Bojangles of Harlem”, which shows us the full breadth of the perfectionism he brought to his art, but also reminds us that his solo efforts (technically breathtaking as they were) usually lacked the warmth of his collaborations with Rogers, the satisfaction that comes with seeing two performers in complete harmony. In the list of the most graceful and enduring things cinema has given us, their partnership must stand near the very top. P.S. YouTube can be so useful and so infuriating at the same time. Here’s a video of the full “Never Gonna Dance” routine, though a tiny box on a computer screen is hardly the place to watch this sequence for the first time. (As Norma Desmond said in Sunset Boulevard, “I’m still big, it’s the pictures that got small.”) And here’s another great dance, the “Cheek to Cheek” number from Top Hat. And a nice, sardonic but affectionate review by Alan Vanneman on Bright Lights Film here. All that, and no mention of Dorothy Fields? Tsk! Tsk! but also reminds us that his solo efforts (technically breathtaking as they were) usually lacked the warmth of his collaborations with Rogers, the satisfaction that comes with seeing two performers in complete harmony. Truly. You just have to watch Funny Face to know this (much though I love Audrey Hepburn). Space Bar: thanks. I half-expected your comment to say, "But I saw this film yesterday too!" About Hepburn (who was 30 years younger than Astaire) - I'm a little surprised by her frequent romantic pairings with much older men. Grant in Charade, Cooper in Love in the Afternoon, Bogie in Sabrina. She was so waifish to begin with, she should really have played their 14-year-old granddaughter or something. Amazingly, I haven't seen Funny Face. Have seen a couple of the musical numbers from it though. J'wock: Ah, but if we're focusing on the singing then Astaire & Rogers aren't a patch on Armstrong and Fitzgerald. That's actually part of my problem with these movies - I enjoy them, but I can't help finding the soundtrack disappointing. SB: I don't know. Certainly he's fairly excruciating to watch in Funny Face (though I must confess I've never cared for the man anyway), but I think there's a confounding effect of age, made more obvious by Hepburn's presence. Is Astaire in Funny Face worse than Astaire in Swing Time because he's not with Rogers or because he's 37 in the first and 58 in the second? To my mind, the Astaire & Rogers/ Armstrong and Fitzgerald comparison isn't so relevant, partly because my introduction to most of these songs was through Astaire and Rogers singing them, in a certain context, in these movies (long before I heard Armstrong or Fitzgerald). And Astaire and Rogers are certainly decent enough singers to convey an idea of the loveliness of the songs (again, as heard in the context of the film, rather than alone in a room with your eyes closed and a gramophone playing). J'wock: Yes, I know. But what are comments for, if not to read too much in? On the songs - I think you're absolutely right about the importance of what you come to first. For me it works the other way round - I'd heard (and loved) the Armstrong / Fitzgerald recordings long before I ever watched the film, so when I saw the film my initial reaction was all "no, no, you're singing it all wrong". I agree that that isn't the point, of course, and that Astaire and Rogers do a good job on the whole - specially since the real reason they're there is to dance (can you imagine Armstrong and Fitzgerald trying to take that on - the imagination boggles). Jai: No, no - that would be repetitive. Good point about all those aging heroes. One film I saw recently with AH where the leading man wasn't edging towards decrepitude was Paris When It Sizzles. But I guess How To Steal A Million would also qualify in the young-hero category. Peter O'Toole...*deep, long, sigh*. Falstaff: Age, yes. But also a severe lack of chemistry between the two. It really was a dreadful film. And O'Toole was younger than her. Basically, the poor woman was never part of a romantic pairing where the guy was, say, between 5 and 10 years older. No wonder she always looked so wistful. "no wonder she always looked so wistful"--I think that was a major part of the charm. Puranjoy: I dunno. I liked Audrey in a few films, but to me she'll always be the Other (and definitely Lesser) Hepburn. Jai - *Excellently* written review. A real pleasure to read. Was pointed to it by a friend after she read my own, recent blog-post on my own [first] viewing of a Fred-and-Ginger movie (which happened to be "Top Hat"; after reading your article, and Wikipedia's, "Swing Time" has advanced to next-in-line on my agenda). Btw, the link that you've provided to the "cheek to cheek" sequence on YouTube has already gone dead --- YouTube has taken that one down. But I did find another one (http://www.youtube.com/watch?v=2LWMKl6vHjc), which, although it does have somewhat annoying sub-titles in Spanish for the first bit, does at least show the full-screen version of the clip and doesn't cut off the dancers' feet. You do know what DOrothy PArker said about KAtherine Hepburn, don't you? That she ran the whole gamut of emotions from A to B. Space Bar: in Tracy and Hepburn, Garson Kanin tells of working on a film with Dorothy Parker and being surprised when she spoke effusively about Hepburn's talents. When he asked her about the "A to B" jibe, she looked sheepish and said something to the effect of, "You know how it is - people expect you to say funny things, so you say funny things." Another good example of how one mustn't take all quotes attributed to the Great Wits/Wags at face value (Oscar Wilde was, of course, the classic example). I would agree though that some of Kate's best-known performances haven't dated too well. Jason: thanks. I love Top Hat too, but Swing Time is a warmer film in my view (despite being set in a snowy winter) - perhaps because of the songs. how one mustn't take all quotes attributed to the Great Wits/Wags at face value. Hmm. Well, of course one mustn't; but one needn't assume the disclaimer to be more sincere because it is less witty and less memorable either. 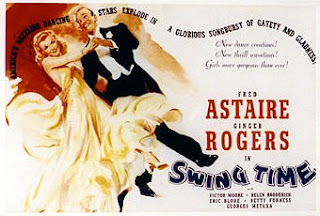 I never warmed to Swing Time, especially after the hype about it being the best Astaire-Rogers movie ever. For all his pedigree, George Stevens didn't impress me with this musical. I much prefer the unknown Mark Sandrich's triple hit of Top Hat, Gay Divorcee & Shall We Dance. I think that "Swing Time" is a darker film than any of Sandrich's offerings. Arlene Croce wrote that it's "Top Hat", only upside down. It's the first film where Fred doesn't know his own mind fully, until the end. I like the variation...and I for one, perhaps the only one...actually like the Woodhousian ending in laughter. Everyone is right when they say that the dances have such emotional weight compared to the plots. I think that Stevens felt he needed to balance the emotional power of the dances with a strong comedic ending. Croce thinks it doesn't work...but I think the comedy was well supported by the facts of the script...and that laughter was the strongest device to change, yet again, Penny's mind. In this film, the main conceit is centered upon the changing of minds...and Penny changes her mind about Lucky no less than four times! This is the fun of the film...and they are fully needed to counter point the weight of this great film. Space Bar -- I whined at the husband until he put Funny Face on, simply because of Hepburn. I'm not a fan of Astaire as such (although he is). What a rotten film. This piece brought back the memories of that afternoon. My favourite dance, Jai, is the one where Astaire dances on the ceiling. I still haven't figured out how he does it! I felt The Gay Divorcee was possibly the best Astaire-Rogers film as far as scripts go, though it didn't have their best dance numbers.